This spectacular flag of 38 double-appliqué cotton stars hand sewn onto a wonderful teal blue canton is the handiwork of Mrs. Mary Jane Schulthies of Hummelstown, Pennsylvania, just east of the state capital of Harrisburg. Most likely the flag was made to celebrate the American Centennial on July 4,1876, which closely coincided with Colorado, our 38th state, entering the Union less than a month later on August 1, 1876. The flag is an exceptional example of a very rare triple medallion pattern, with three rings of stars surrounding a single central star and flanked by four corner stars, one in each corner of the canton. One of the most striking aspects of this flag, aside from its wonderful medallion pattern, is the exceptional condition of the flag. One can find virtually no holes, staining, fading or foxing on the flag. In fact, it looks nearly exactly as it looked when Mary Jane made her flag over 130 years ago. An interesting addition to the flag is a top hoist running the length of the flag, which shows evidence of having been used to tack the flag along the top edge so that it could hang from a rafter or banister. It's clear from the condition of the flag that it was not flown outdoors for any length of time, if ever. The workmanship of the whip-stitched grommets is one of the finest I've ever experienced on an American flag, and and the treadle stitched stripes are exceptionally well done. Likewise, the hand stitched cottons stars are finely sewn, with each star positioned with great precision and exactly paired with its counterpart on the back of the flag. 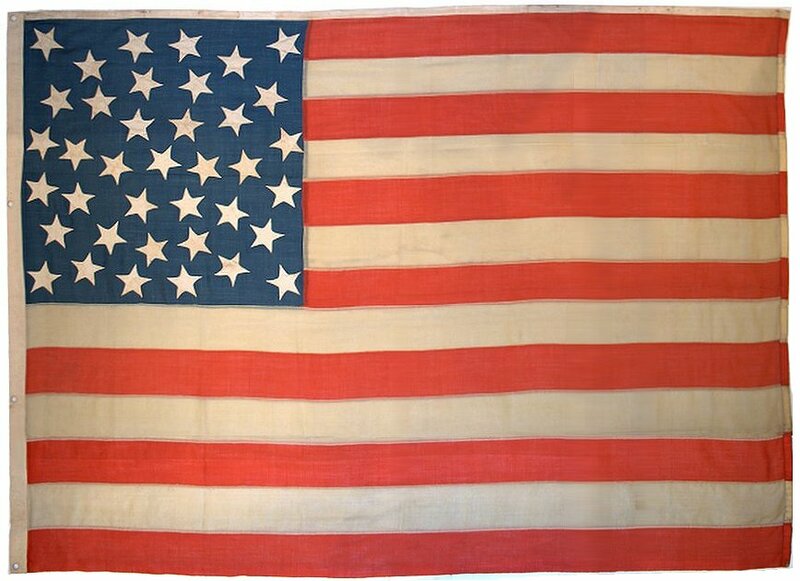 All in all, Mary Jane Schulthies' flag survives as an outstanding piece of workmanship, and, in all aspects, is a masterpiece of American Flag making from the Centennial Era.